TV production doesn't exist in a vacuum. 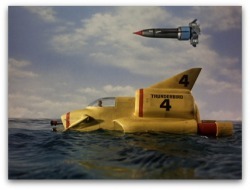 Reg Hill, Derek Meddings, Mike Trim and the rest of the AP Films/Century 21 SFX crew didn't create Supercar, XL5, Stingray, the Thunderbirds and all the other wonderful craft we know and love out of thin air. Dr Phil Atcliffe will talk about what some of them were, and what others might have been.